Hey devs - are you ready to dive into the Big Dark? Take the new Developer Economics survey. 40,000 developers as they are shaping the future of software development. 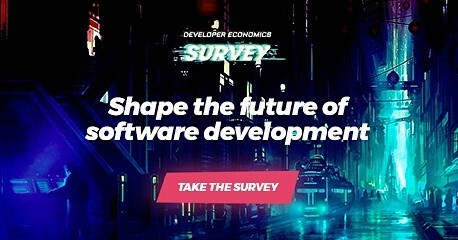 ⚡The 14th edition of the Developer Economics survey is here and it aims to shed light to the future of the software industry! ◾ What’s going up and what’s going down in the software industry? ◾ Are you working on the projects you would like to work on? ◾ Where do you think development time should be invested? Amazing prizes  up for grabs: an iPhone X, an Oculus Rift headset, a Pixel Phone 2, 3 Raspberry PIs, Alibaba Cloud vouchers and more. A Developer Scorecard showing how other developers respond to the questions you also answered. Access to the State of the Developer Nation Q1, 2018 Report with the key findings (February 2018) of the survey. ▪ If you are into Cyberpunk this is the survey for you! Care to find out if you are a Pull-Request Commander or a Console Boy? Just take the survey.